Here is my next Cupcake card that follows a similar format to yesterdays card, but it has a portrait orientation instead of landscape. I wish I had the time to use Liquid Applique on all 99 cards I’m making because I absolutely LOVE the result. I sprinkled ultra fine prisma glitter over the liquid applique on this cupcake before heating it up. I’m not one of those people who has the patience to let Liquid Applique dry before heating it and I actually prefer the bubbly, fluffy effect you achieve from heating it while it’s still wet. If you were to allow it to dry first it would be slightly smoother when heated. 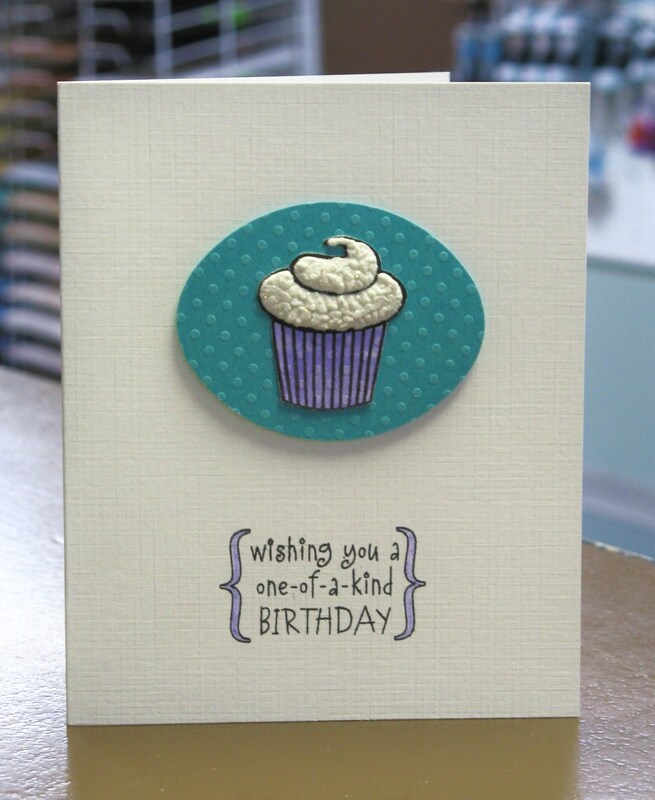 I’ll be back on Thursday to post my next two cards as I won’t have internet access tomorrow and will spend the day “baking up” some cupcake cards. See you then! Cute cupcake! Loving this color combo!